Welcome to the 36th edition of I and the Bird. This is only the second time I have hosted a blog carnival, so please forgive me if I've missed anything out! 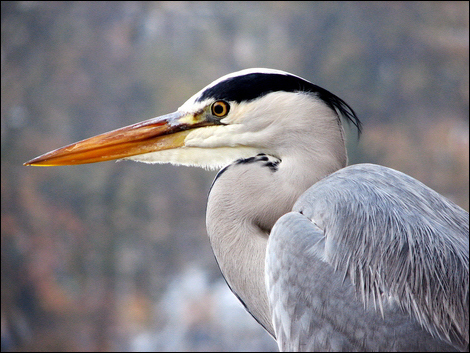 Lynn Morag took this superb photo of a grey heron (Ardea cinerea) in The Netherlands. She says, "I was around two metres away; this heron is so confident around people. He kept an eye on me but was quite relaxed and posed beautifully." In The Natural Stone Brian reports on an outstanding weekend of birding in Britain's wild west: Cornwall and Lifers. In Another Place, Otis vents his spleen about the tantalising reports of a very rare visitor, which left his Sunday Ruined. At Skills-Bills, Tom tells an entertaining story about visiting the Oxfordshire Scops Owl in his ageing Ford Fiesta (contains strong language). Craig of Peregrine's Bird Blog presents a post titled The VERY messy Grey Wagtail. Mike of 10,000 Birds tells of avian conflict at his local reservoir: Eagles and Cormorants Just Do Not Get Along. There's more conflict at The Greenbelt, where The Ridger describes a Duel at Twilight. In A DC Birding Blog, John offers a belated Halloween post about Crows and Ravens, the latest in his series on 'Birds of the Mid-Atlantic'. Fred of Fragments from Floyd is also on the trail of corvids: Raven's Call ~ Part One. Over at The Hawk Owl's Nest, Patrick finds out which bird has been Drilling Holes at Willowwood Arboretum. On the Tortoise Trail, Pam reports on the havoc caused by a juvenile Cooper's Hawk. Over at Principled Discovery, Dana tells of some of the birds that have being visiting her feeders: Our most welcome winter guests. In Woodsong - Off the Beaten Path, Cindy presents a poem by Paul L. Dunbar: The Sparrow. Matt of SitkaNature introduces a unique tree-nesting seabird in Marbled Murrelets. In Cup o' Books, Seth describes his visit to the Iroquois National Wildlife Refuge. In the Boreal Bird Blog, Jeff gives an account of his trip to Mexico for the North American Ornithological Conference: In a Mexican Courtyard. Lillian and Don of Stokes Birding Blog tell of some of the Rare Birds that have turned up in their neighbourhood. In A Silent Killer, Leigh warns of an unexpected threat to small birds. Posted at Alis Volat Propiis. Sharon presents Support Protections for Shorebird and Wading Bird Habitat posted at Birding In Maine. Over at A Snail's Eye View, Snail ponders the classification of the Anseriformes and asks Why a duck? Er ... goose?. Trevor of Trevor's Birding describes another Great Birding Moment: photographing Musk Lorikeets in a garden near Adelaide. In Sandpiper Safari, Duncan of Ben Cruachan Blog describes a day out looking for waders/shorebirds in Gippsland, Victoria. Don't forget that the next edition of I and the Bird will be hosted by Five Wells at the end of November. I like the use of the headers, great layout. Looking forward to rooting through it. Lovely! Original and fun, Roger. Thanks for including my post. (I see I'll have to jazz up my header.) I'm looking forward to a relaxing Sunday afternoon immersed in birds from both sides of the Atlantic. Great collection Roger, nicely done. So much to read. This Iatb will definitely keep me occupied for the next fortnight. BTW, I'm with Pam—having seen my mundane header among the works of art I'm going to have to liven it up. Wow Roger, what a collection of wonderful photos. Brilliant. An ecologist and photographer based in the north of England.